Greetings from Phoenix Systems, Chennai. 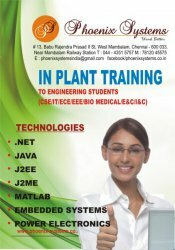 We are provide Inplant training for students to enhance their knowledge on software, Embedded Systems and Power Electronics. We also give them exposure in real time industry knowledge. Phoenix Systems Learning offers rich & engaging instructor-led training on complete suite of all popular technologies. Trainers are delivering, a relevant and guided learning experience that combines lecture and practice to deliver what you need to know about a product or technology. Training on Tools & Technique for all sessions. Subjects delivered will differ to each department.